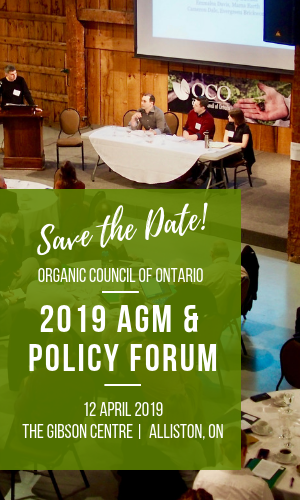 Since joining OCO in early 2016, Carolyn has placed renewed emphasis on serving members' needs and campaigning for an Ontario organic regulation. Prior to joining OCO, Carolyn worked as the Director of Sustain Ontario, the alliance for healthy food and farming. Together with member organizations, she advocated for the support of healthier food systems through education, network development and collaborative action. Before Sustain, Carolyn had extensive experience in food security, farming and environmental policy issues through her Masters research focused on farmers' markets and her time at the Stop Community Food Centre. She has worked on farms and farming issues in four provinces in addition to visiting farms across Canada and abroad as an Independent Organic Inspector. Laura joined OCO in September of 2016. She comes from a rural background and has a wide range of experience in agriculture, administration, and non-profit communications. Some of this experience included apprenticing as a farmer and then running her own market garden -- before realizing that contributing her communication skills to the good food movement was a better use of her talents! Laura has a B.A. in English Literature from Carleton Univerisity and a Graduate Certification in Corporate Communications from Seneca College. She lives in Toronto and originally hails from the world-famous municipality of Tweed, Ontario. Dora joined OCO in November 2018, and brings over seven years of experience in project management, communications, and event planning in both the non-profit and private sectors. She is excited to work for the Organic Council of Ontario because she is passionate about sustainability and food. While she is new to the food and agriculture landscape, she is looking forward to learning more about the organic sector and getting to know OCO's diverse membership. Dora graduated with a BA in Political Science & History from the University of Toronto. She is also currently enrolled in Ryerson University's continuing education school, working towards a certificate in food security. Amy Hamblin Smith joined OCO in March 2019. Originally from the Annapolis Valley, Nova Scotia, Amy grew up visiting farms with the local veterinarian (her dad), and worked in fields, orchards, farm markets and wholesale for several years (she can even drive a fork lift). Amy holds a BA from Concordia University and an MA in Communication and Cultural Studies from Ryerson University, where she researched second-hand economies. She comes to OCO from the Youth Research and Evaluation Exchange - a government initiative housed at York University - and PEN Canada, a human rights organization focused on freedom of expression.